If you're going to talk smack about someone else, you better be able to back it up. Well, when Alice Cooper asks Noisecreep, "Are all American bands metro-sexual now?" dude can back that s--- up. One of rock's living legends, Cooper has had it with the lack of real men in rock. "I heard the title Vampire Weekend and I thought, 'Oh, man, that's gonna be great. I gotta see it,'" he says. "And there are these guys with little Gap T-shirts on and I'm going, 'What happened to the balls in rock 'n' roll? Why are American bands so wimpy?'" Who does earn his hard rock seal of approval? "The Foo Fighters get up there and they rock, they know how to rock. Green Day rocks, they get up there and they have energy," he says. "I am worried that a lot of the newer bands that are coming out are depending too much on keyboards and being sensitive. Maybe I'm just not sensitive anymore. I like to hear a band be stupid and drunk. I wish I could see more bands like that were like early Guns N' Roses, early Aerosmith, just snotty rock 'n' roll bands." Along with his very entertaining look at today's music scene, Cooper filled Noisecreep in on his new tour, the best way to kill Alice and why it's only a matter of time before we see his music on Broadway. What can you tell us about the upcoming tour? It's a brand-new show. Everybody's got to remember a million new parts, new theatrics. They kill me four times in the show, so if I'm in the wrong place I get stitches. So you get killed four times? It's a four-part show, sort of like four different faces of Alice, and at the end of each part we have to execute him to get to the next part. The guy that directed it is the guy that directed 'Beauty and the Beast' on Broadway, so it's really pretty elaborate. The lyrics of the songs tell the whole story. We really depended this year on the lyrics to pull you through every segment and all the songs. We've never done that before, but I really like the idea. It's like taking those songs and doing something different with them. That brings up a good point. You were doing concept albums in the '70s, and it seems like a natural for there to be an Alice Cooper musical on Broadway show. Will we ever see that? I can't imagine there not being one. There's already been talk of 'Welcome to My Nightmare' on Broadway, 'cause when we did that it was basically a Broadway show. The director was from 'West Side Story,' everybody involved in the show was from some sort of legitimate theater. And then we just all put it all to Alice Cooper insane rock 'n' roll and Alice's insane concept of what theater was supposed to be. And it turned into something that nobody had ever seen before. 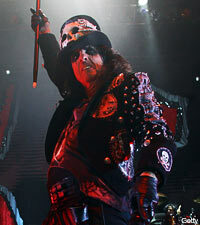 How would Alice Cooper on Broadway top the tours? First of all, I would love to see something about Alice, the story is great. From Phoenix to the alcoholism, the fact that Alice is married successfully for 33 years, there's so many things that contradict each other. And after 40 years the band that all the critics said would last two weeks, I'm still here and I'm still selling out the place. So my idea of add a little Busby Berkeley, throw a little Bela Lugosi in there and terrify the audience, but make them laugh at the same time and don't give up the rock 'n' roll has worked for 40 years. And create a character that people actually really like. When I started Alice, there was no consummate villain in rock. There were a lot of heroes, but no villains, a lot of Peter Pans and no Captain Hook. And I went, "Well, I'll gladly be Captain Hook." Forty years later, I'm still the premiere villain in rock. So whatever it is the audience liked, they liked the idea that it's funny and it is scary and it's a lot of different things. Obviously for the Broadway show, you envision the music would still all be Alice. Oh absolutely. The nice thing is the music is built in. If somebody were gonna say, "Let's write a bunch of songs for an Alice play, I'd go, 'They're written.'" In fact, they're not just written, they're hits already. I can go back for 40 years and give you 15 top 10 hits that are already proven. So in a lot of ways it's like Billy Joel or Abba or the Who that went to Broadway. You've already got these songs, so it's sort of a slam dunk. All you gotta do is do something really interesting on Broadway and really make it interesting. What would be the three songs that absolutely have to be in the play? Well, 'Ballad of Dwight Fry' because it really was the most theatrical song. You're writing a song about a guy that's in the original 'Frankenstein' and the original 'Dracula' and never got any due. He was the character that played Fritz and Renfield, the creepy little character. I do it in a straitjacket under a cold blue light and the audience feels very claustrophobic. I just think 'Ballad of Dwight Fry' may be the best example of a theatrical song for Alice. 'Only Women Bleed' is another one, it's a song that's pretty, it was a hit. When we first did it, the audience actually thought it was James Taylor, not the audience, but the record company. They had no idea it was Alice Cooper. But it's a very dark song that ends up being almost a feminist anthem. It was a brutal ballet and it was saying men bleed physically, women bleed emotionally and that was the point I was trying to get across. The title made everybody think I was trying to get away with some sort of menstrual joke, and it ended up being covered by 12 different women. What's your favorite version from the 12 different women who covered it? When you take a song like that and you put Tina Turner behind it, she's gonna bleed all over that song. And Etta James did it, too. Those are versions I could never do because they're not even singing from their heart, they're singing from their groin on that. It's coming out guttural, women that have been beaten, women that have bled. So they heard that song and all of a sudden they were taking it literally and I was going, "Wow, I can't put that much soul into that song." 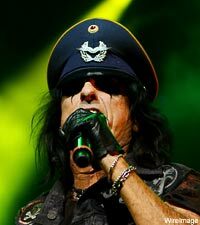 Another song you'd have to have is 'Welcome to my Nightmare' because that just pretty much says what Alice Cooper is. It's some kind of strange, dark, funny vaudeville. And that's all I ever wanted it to be. I always like the idea of vaudeville, horror and comedy all in bed together. And we've never backed down on the rock 'n' roll. I insist on it being loud, I insist on it being 95 percent rock and about five percent ballads. You're never gonna find me turning things down. Of the four ways Alice gets killed, what's the best way to kill Alice? I kind of go to my fears and infest them on stage. The worst thing that could ever happen to me is not snakes and spiders, it would be needles. And of course we have a giant hypodermic needle at the end of 'Poison.' And then another one is being claustrophobic, it's putting me in a box and running spikes through it. And it's a great trick. But you have to do this all to music and make sure that it all makes sense somehow. That's why sometimes I have to bring in somebody like a director from Broadway saying, "Here's all the stuff, here's my idea for the stuff, make it come to life." I haven't got the patience to sit there and go, "Okay, we need to rehearse this, this, this and this." Who are some of the young musicians you admire? There are some very inventive people. Jack White is incredible, because he goes against all the rules. He makes records that really are kind of sloppy and yet his voice and his guitar make it work. Everything that guy does is catchy. I am very encouraged that a lot of bands sound like they're going back to the garage and they're not depending on high-tech crap to be their music. But two guitars, bass, drums, and a lead singer, to me that's rock 'n' roll. I do get a little annoyed that it seems like a lot of bands that come out now that I read, "The greatest band that I've ever heard." And I see them and I go, "There's absolutely no testosterone in this band." I heard the title Vampire Weekend and I thought, "Oh, man, that's gonna be great. I gotta see it." And there are these guys with little Gap T-shirts on and they're singing about I don't know what, it was so light I couldn't listen to it. And I'm going, "What happened to the balls in rock 'n' roll? Why are American bands so wimpy?" I'm getting a lot of bands that are kind of going, "Oh, the summer in the rain and aren't lightning bugs wonderful?" And I'm going, "What kind of drug are you on?" I think if you asked Ozzy, Iggy and all the other people that come from our generation, we're kind of hoping the young guys step it up a little bit when it comes to being guys.